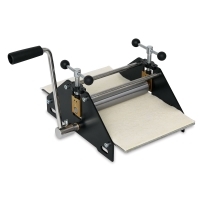 The Blick Baby Press Package is ideal for a variety of printmaking techniques, including relief block printing (both wood and lino), collagraph, embossing, engraving, and etching. The package contains a durable press built in Italy for professional use. It features heavy-duty casting with a 1-3/8" solid steel roller, precise pressure control, and an ergonomically constructed handle for easy rotation. The Blick Baby Press Package includes a 7" Blick Baby Press, a 7-1/4" × 12-1/2" × 1/8" steel bed plate, and a 7-1/4" × 12-1/2" felt blanket. 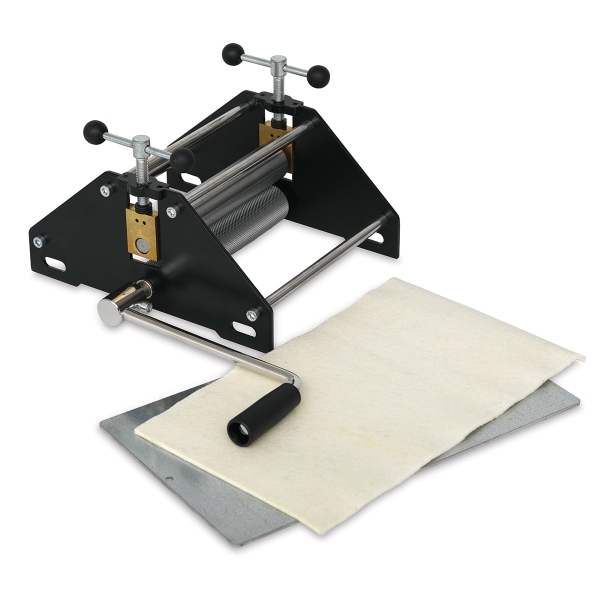 Blick recommends the purchase of an additional Pusher, especially for intaglio printing, for perfect ink transfer and beautiful, deep impressions. Blick Baby Press Pusher Blanket — The Baby Press Pusher is a dense white felt blanket that helps to pull the print surface through the roller while equalizing pressure and strain on the roller. It works in conjunction with the Blick Baby Press.